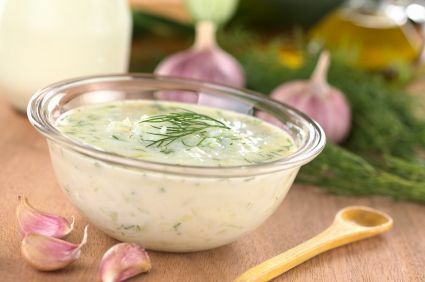 I fell in love with tzatziki the first time I tried it and was on a quest to find the recipe that included those ingredients that pleased my particular palate best. This recipe is low-fat, high-protein, nutritious, smooth, Mediterranean, refreshing, light, and hopefully the best you've ever had! I fell in love with tzatziki the first time I tried it and was on a quest to find the recipe that included those ingredients that pleased my particular palate best. This recipe is low-fat, high-protein, nutritious, smooth, Mediterranean, refreshing, light, and hopefully the best you've ever had! Two things to remember are to strain any plain yogurt that is NOT Greek yogurt (see info below) and to soak the cukes, so a lot of the water is removed to avoid the sauce becoming too runny and thin. Be creative with it! I use it on a hot baked potato, as a dip for fresh veggies instead of that ol', tired, onion soup and sour cream staple, as a salad dressing, or as a sauce to add protein and great flavor to any complex carb. If you don't have Greek yogurt, strain plain yogurt by placing it in a cheesecloth or paper towel-lined strainer, set it over a bowl, and refrigerate it for at least one hour, so the liquid drains out. Peel cucumber(s). Cut in half lengthwise. If not English/hothouse, use a small spoon to scrape out and discard seeds. Grate the cukes, toss with 1 tbsp. Kosher salt, put it in a strainer, set it over a bowl, and refrigerate for at least one hour, so a lot of the cukes' water drains out. Put yogurt in a large bowl. Squeeze as much liquid from the cukes as you can; pat dry lightly in a couple of pieces of paper towel to remove more liquid; add it to a small bowl and wisk in vinegar, lemon juice, olive oil, garlic, dill (or mint), 1/2 tsp. Kosher salt, and pepper. Mix together well. Add to yogurt. Mix well. This can be served immediately; however, it is traditionally served after having chilled well and allowing a few hours for the flavors to blend. Dip in or stuff veggies, use chips, pita bread, be creative and enjoy! Serves about 12 (2 tbsp. per serving). so glad you think so. it took a bit of trial and error, but i sure love it and put it on just about anything to change things up and keep them interesting. THANKS!